The color wheel is a surprising tool to hone our painting skills. Color creates emotions in our paintings. Our knowledge of color boosts our painting skills. 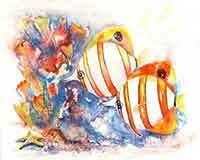 We use color to create the illusion of depth in two dimensional paintings. The variations of color give form to the objects we are painting. It is our clue to selecting the colors for our palette. It guides us when we mix our paint colors. color is just plain fun! The renowned physicist Isaac Newton was famous for explaining gravity. In the 1600s he devised the theory of light and color. He noticed when light goes through a prism; it is divided into the colors of the rainbow. The seven rainbow colors are red, orange, yellow, green, blue, indigo and purple. Artists have been using it to improve our paintings ever since. It is the basis for understanding color. Today's color wheel is based on twelve colors. 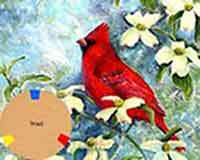 Today artists use the primary color wheel based on the three primary colors red, yellow and blue. The paint colors closest to the primary colors are Lemon Yellow, Permanent Rose and Thalo Blue. 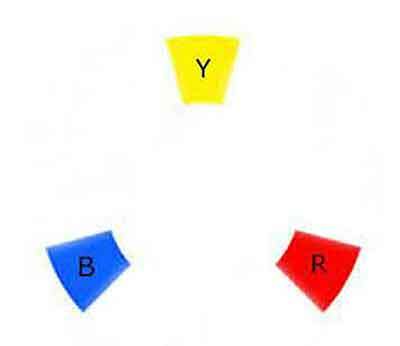 All other colors can be mixed from these three primary colors. When we mix two of the primary colors together, we get a secondary color. Yellow and red make orange. Blue and red make purple, also called violet. how do you make a tertiary color? When we mix a primary color with a secondary color, we get the intermediate colors called tertiary colors. For example, the primary color yellow mixed with the secondary green gives us yellow-green. If we go to the other side of yellow and mix it with the secondary orange, we get yellow-orange. 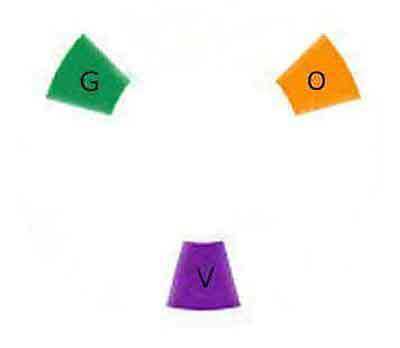 The tertiary colors are; yellow-green, yellow-orange, red-orange, red-violet, blue-violet and blue-green. We use the color wheel to select the colors for our paint palette. We use it to choose our colors for a painting. We use it for mixing colors while we are painting. Color gives life to our paintings. 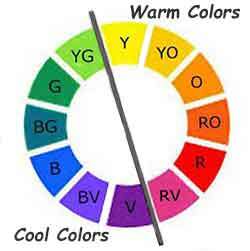 The color wheel contains warm colors and cool colors. Red, orange and yellow are considered warm colors. The warm colors appear to advance forward in the painting. Blue, green and sometimes violet are normally considered cool colors. Cool colors appear to recede into the distance. 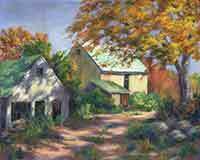 We normally do our paintings on a two dimensional surface of canvas or paper. When we look into the distance colors get lighter. They also get cooler. Suppose we have a field of yellow flowers. Even though yellow is a warm color, it will get cooler when it goes into the distance. We create the illusion of distance and depth in our two dimensional paintings with our use of color. Use warm colors up close in the foreground portions of the painting. Use cool colors for the distance. "Springtime" is a prophetic painting. 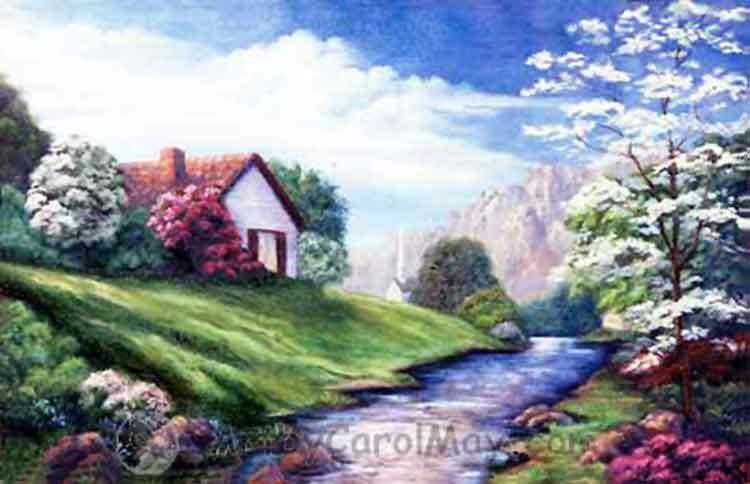 In the painting "Springtime" warm colors show that sunlight is shining on the mountains. The addition of blue moves the mountains into the distance. Paint the part of an object that comes toward the viewer with warm colors. Paint the parts of an object that turn away from the viewer with cooler colors. 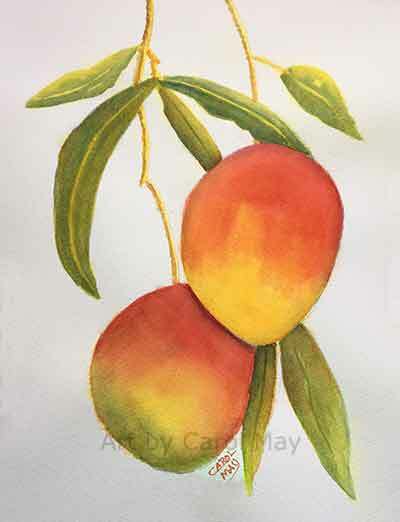 We painted cooler and darker colors on the edge of the mangoes to show them turning away from our view. But you say red and orange are both warm colors. You are correct. However orange is a bit warmer than red and yellow is warmer than orange. If the edge has bright light shining on it, you won't paint it darker, but still paint it cooler to show it is turning away. 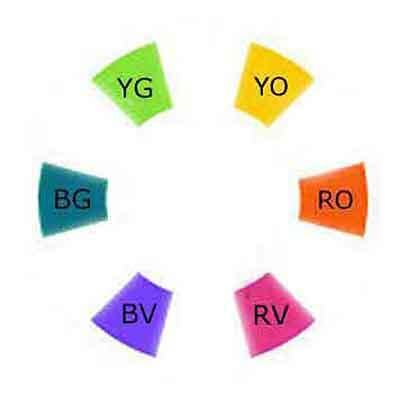 Use a warm and cool version of each of the six basic colors of the color wheel.  These are the natural colors found in the rainbow. When you include a warm and cool version of the six basic colors, it is easier to mix additional colors. 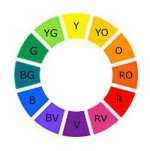 What colors do I use on my watercolor and oil palettes? Using a limited palette of the primary colors (yellow, red and blue) is a great way to learn about color. 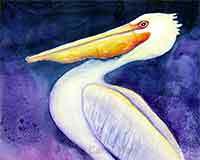 Use Cadmium Yellow Light, Permanent Rose and Ultramarine Blue plus white. An expanded palette with a warm and cool version of each primary makes it easier to mix the other colors. There is no need for black on your palette. It is easy to mix black, brown or grey from complimentary colors on the color wheel. Plus we save money because we don't have to buy all the colors in the art store. Click Here to get your Color Mixing Guide with a Color Wheel. learn more about color and have fun painting!